Friends of Safe Schools USA- Pennsylvania presents this unique symposium featuring THREE internationally renowned School Safety professionals: Michele Gay– Co-founder and Executive Director of Safe and Sound Schools, Jermaine Galloway– a retired police officer and one of America’s top experts in various drug and alcohol trends, he has specialized in underage drinking and drug enforcement for more than 15 years, and Lt. Col. Dave Grossman– a former West Point psychology professor, Professor of Military Science, and an Army Ranger, who has combined his experiences to create a program of instruction on school safety and healthy students. Please join us for this TWO DAY symposium as we explore the multifaceted issues surrounding safety in today’s schools. Other renowned safety experts will also be on hand to discuss school safety best practices. National Experts at a Local Level! Michele Gay will present “Beyond Tragedy: Response and Recovery in a School Based Crisis”. Following the tragic loss of her daughter, Josephine, in the Sandy Hook School tragedy, Michele travels across the country sharing her message of inspiration, recovery, and school safety education and advocacy. Jermaine Galloway will present “High in Plain Sight”. This workshop covers alcohol and drug clothing, alcoholic energy drinks, alcopops, alcohol and drug concealment methods and containers, drug paraphernalia, drug related music and groups, logos, stickers, new technology, party tendencies, party games, non-traditional alcoholic beverages, social networking sites, synthetic drugs, OTC drugs, inhalants, concentrates, E-cigarettes, and popular party drugs. This session also identifies common stash compartments that can be used to hide weapons inside everyday clothing containers and other items, in addition to the impact on traffic safety. Lt. Col. Dave Grossman (Ret.) will present “Safe Schools and Healthy Students” addressing new killers in the 21st century; important drills that nobody practices; violent visual imagery; reality vs. fantasy; and video games that are more dangerous than movies. Who should attend? : Law enforcement, treatment and recovery professionals, school administrators, safety and security coordinators, teachers and other school personnel, corrections officers, adult and juvenile probation officers, parents, pastors/clergy, counselors, coaches, community-based program staff and volunteers, etc. Special room rate of $93.00 per night for those attending the symposium. Hotel reservations must be received by 02/19/2019. Congratulations to Tri-State Executive Committee member, Dr. Gennaro Piraino, Jr., Franklin Regional School District Superintendent on being awarded the 2019 Pennsylvania Superintendent of the Year by PASA! During the 2017-18 school district, an amazing thing occurred in the Avonworth School District. A group of students called JAM Enterprises, which is a group of about 54 girls from ages 5-12 that meets weekly to combine their creativity and compassion to come up with ideas to help others. Their ideas always result in a product that they can then sell and then give the proceeds to local non-profit causes and organizations. During one of their meetings, one of the younger girls spoke up and gave her heartfelt plea for the need for more kindness in the world. She simply said that she wished people could just be kind. Out of that moment, the #bethekindkid message was born. The girls came up with the hashtag and decided to put it on t-shirts to sell and donate proceeds to help cure cancer. At the time, no one could foresee how far the message would spread. First, staff and students started to purchase the t-shirts and wore them to school in an effort to spread the message of kindness. 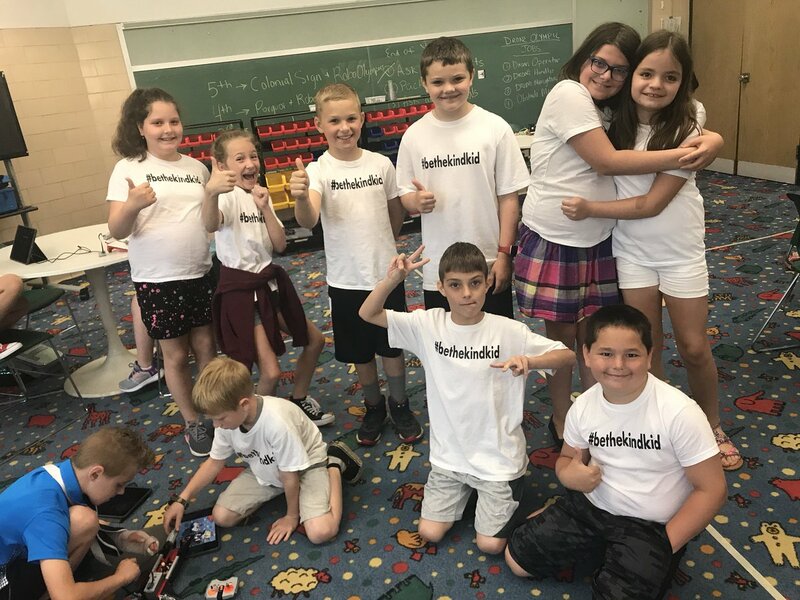 Eventually, the entire district staff started to wear the #bethekindkid shirts on Wednesdays. As the 2018-19 school year gets underway, the tradition of wearing the #bethekindkid shirt on Wednesdays will continue. To date, the group has sold well over 3,000 t-shirts with many districts in the area purchasing the shirts for their staff. Orders are now rolling in for hundreds of shirts. It is truly amazing to see how this message of kindness is spreading around the Pittsburgh region. We are pleased to invite you to attend Legends of Learning’s lunch and learn at the Edgewood Country Club on October 17th from 11-1 pm to discuss how game-based learning can catalyze student engagement and increase academic performance. We will share more about how we have used ongoing research from Vanderbilt University to build a platform of over 1,000 games and simulations for 3-8th grade students. *This event is hosted by Legends of Learning, not the Tri-State Area School Study Council.